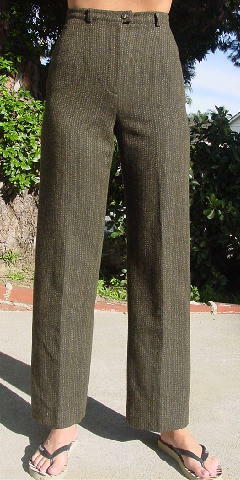 These 98% wool and 2% rayon vintage pants were made in Italy by Salvatore Ferragamo. 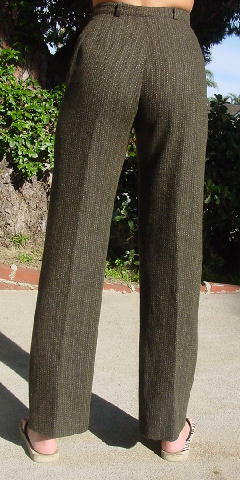 The fabric is in a medium brown with dark brown angled wide lines and a running white vertical stitch accent. 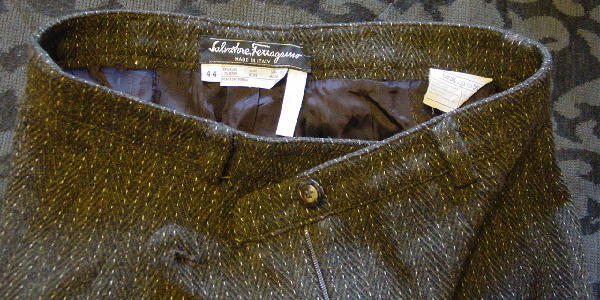 They have a dark brown 60% acetate and 40% rayon full lining with Salvatore Ferragamo in tone-on-tone letters in various places on the lining. 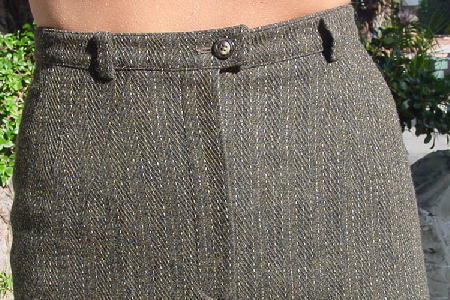 There is a 6" long zipper fly, belt loops, 1 1/8" wide waistband, and a multi-tone interior and exterior waist closure button with Salvatore Ferragamo etched on both. The tag says 42, but they fit like an American size 4. They're from an Italian actress who now takes a larger size.